Duct tape is useful for many things, but not always easy to remove all traces. This guide is about removing duct tape residue on a car. I've recently experienced the same problem. I used a little bit of gasoline and it came right off, worked great! I used tape to cover a broken car window. Now that the window has been repaired, tape residue is on the hood and trunk of the car. I don't want to ruin the paint, but want to remove the tape residue. Help. I use Avon Skin So Soft bath oil. It doesnt damage car finishes. I have even used it to remove tar! There is another product called goo gone that is available in stores that I heard works too. Peanut butter. Just rub it over the area with a cloth or paper towel and voila! I know it sounds odd, but it works every time. "Goo Gone" or "Goof Off" will remove it. Any household oil...good old vegetable oil poured on a clothe that can sit on the sticky spot to saturate it for a minute - then rub right off. Shot it with a good dose of WD40. This is how grocery stores get tags off products that they resell as told to me by a grocery store manager for nearly 30 years! I have tried it at home AND it does work! If the other stuff doesn't work, I'd try cigarette lighter fluid. It's actually pure naphta, the original dry cleaning fluid!. It works on cloth too. Obviously, be carefull because it is very flammable. Here are the things I tried that you guys suggested for the duct tape removal, baby oil, lighter fluid and wd 40 - no luck! I didn't try the vegetable oil or peanut butter. Easy, hardly any elbow grease was used. Works beautifully, don't bother with anything else. Trust me! DONT DO THAT!!!! Acetone will dissolve the paint! Does anyone know how to remove duct tape from the outside of a car? It is on the paint and around the back windshield. I am currently using Orange Blast, an auto degreaser. It is working, but very slowly. Any faster suggestions that would save the paint on my car would be great. Have you tried a hairdryer?...You may have tape residue left, but you can remove it with mineral spirits, lighter fluid, Goop or turpentine. I asked my DH, who works on cars. He said to get adhesive cleaner at Home Depot or an auto parts store. then clean as usual!! It will soften the glue in the duct tape= My Hubby got burned with Hot Tar on a roof job- & it worked Great on removing the tar after it had cooled on Him!! Try a second time, if needed! I had the same problem so I did a search and found this thread. I used WD-40 and it worked great, even on the weather stripping! Thanks! Have not tried it yet, but another blog said use tongs and boiling water then rub it off. I have not tried this yet, but another source said to use boining water with tongs and then rub it off after it has softened. 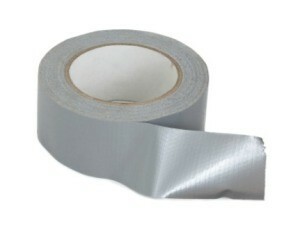 How do you remove residue from duct tape on a car? Saturate with either WD-40 or Mineral Oil and let it remain on for about an hour; you should be able to clean it off with a soft terry cloth or microfiber towel. I looked for weeks at tape/adhesive residue on a window on my car that was a large sticker of the car's info. I tried everything then bought a small container of goo gone. I was nervous as the windows had factory tint. I put the goo gone on a soft cloth saturating a place on the rag. Next I rubbed about an inch and wow, it was gone. I proceded to rub small areas and resaturating a different / clean area of the rag and had this removed in 2-3 minutes. I did not harm the factory tint, I cleaned with foam glass cleaner and could not see the big sqare of adhesive anymore. I was elated with the magic of goo gone. In my case, I had clear packing tape residue stuck on the side of my Mercedes, so I didn't want to use anything abrasive whatsoever that would scratch the finish. I looked around and found I had the following options. WD 40, Olive Oil, Carnauba wax. The WD40 did not work for me. What did work was to repeatedly soak the area in olive oil, then rub aggressively with a microfiber cloth and then I put carnauba wax on top of it which finished the job. The oil and wax slowly dissolved the tape glue. It took repeated rubbing over the area. In my case it took 45 min. but it got all the tape residue off and the finish was fine. I need to temporarily use duct tape to reattach my side mirror to it's frame. Will this tape damage my car paint?